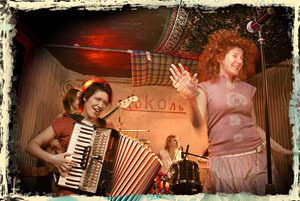 Iva Nova, a crazed all-women band that combines Russian folk and punk, has a reputation as one of the best live acts on the club circuits of both Moscow and its hometown of St. Petersburg. But its concert at Orlandina on Wednesday will showcase, if belatedly, the band’s studio work. “A lot of fans say it’s best to listen to us live. It’s difficult for us to record — we lose half of our drive when recording, so we try to decorate it with arrangements,” drummer Katya Fyodorova said in a recent interview. Iva Nova’s new album, “Chemodan” (Suitcase), was recorded in the local Dobrolyot studio and released by the Moscow-based label Geometriya in November. It features songs in Georgian, Tartar and Bulgarian, as well as Russian. Fyodorova — an accomplished drummer who was asked to stand in for Faust’s drummer during the krautrock legends’ British tour in 2002 — said Iva Nova’s folk-punk style dates back to the founding of her first all-female band, Babslei, in 1998. That group started as a joke act for an International Women’s Day party at Moloko, St. Petersburg’s seminal, now-defunct underground club. At the time, Fyodorova said, her bandmates weren’t strong on musical expertise. “We all knew folk songs from our childhood, and we just tried [them] and it turned out great — so we put them on three chords, and got our style,” she explained. Iva Nova formed in 2002 after three members of Babslei, including Fyodorova, quit because of personal differences. They started Iva Nova, which went on to release a self-titled debut record in 2003 and a live DVD, “Zhivaya!” (Alive! ), in 2005. “Suitcase” is the band’s second album. “I didn’t like the first album at all, because we were recording it in Moscow and had to travel there, one by one, separately — that’s why it came out not that strong,” said Fyodorova. Over the past few years, Iva Nova has experienced a number of lineup changes — partly due to its gender make-up. “Because we’re a female band, everybody leaves when they have babies,” Fyodorova said. Apart from Fyodorova and original guitarist Inka Lishenkevich, Iva Nova now features three new members: vocalist Nastya Postnikova, accordion player Elnara Shafigullina and bassist Katya Grigoryeva. Postnikova used to sing in Baobaby, an alt-rock band from Pskov, also with an all-female lineup, while the Chukotka-born Shafigullina had a stint in Babslei. For bassist Grigoryeva, who previously worked as a bartender at Moloko, playing with Iva Nova is her first musical job. The lineup changes have affected the band’s sound, Fyodorova said, singling out the departure of vocalist Vera Ogaryova and the replacement of bayan player Lena Zhornik with accordionist Shafigullina. “Elnara is a very original player, and she brought a lot of her own into the music, so it became more interesting, especially with the new songs,” Fyodorova said. Fyodorova also works with experimental bands ZGA and FIGS and has recently appeared, as a prostitute, in “Ulitsa Razbitykh Fonarei” (“Boulevard of Broken Streetlights”), a locally made television series. Iva Nova showcased “Chemodan” at Dom, Moscow’s respected venue for avant-garde and world music, in November, but had to postpone the local premiere until Feb. 14, because the venue, Lensoviet Palace of Culture, had second thoughts, according to Fyodorova. More recently, the band moved the show into the smaller Orlandina club. Wednesday’s concert at Orlandina will feature Ogaryova, who no longer performs live with Iva Nova but continues to work with the band in the studio. The band will also be augmented by several men who guested on the album: saxophonist Nikolai Rubanov and tuba player Mikhail Kolovsky, both of the St. Petersburg art-rock band Auktsyon, trombone player Ramil Shamsutdinov, formerly of Markscheider Kunst, and Skazy Lesa’s Vladimir Molodtsov on bagpipes. During Iva Nova’s lifespan, the original idea of fusing Russian folk and punk has evolved, Fyodorova said. Culture news archive for 09 February' 2007. Culture news archive for February' 2007. Culture news archive for 2007 year.